All photographers compete for the 3 IPPAWARDS Photographers of the Year. 1st, 2nd and 3rd place. All images must be taken with an iPhone or an iTouch. The photos should not be altered in PhotoShop or any desktop image processing program. The use of any iPhone Apps such as Hipstamatic, CameraBag, etc. are permissible. In some cases we may ask the original image to verify that it’s taken with an iPhone, iPad or iPod Touch. All entries compete for the prestigious IPPA Photographer of the Year Award title, and the top 3 will receive a 16GB Wi-Fi iPad Mini. The top entry from each of the 16 IPPA categories will win a Gold Bar from the most recognizable private gold mint in the world. 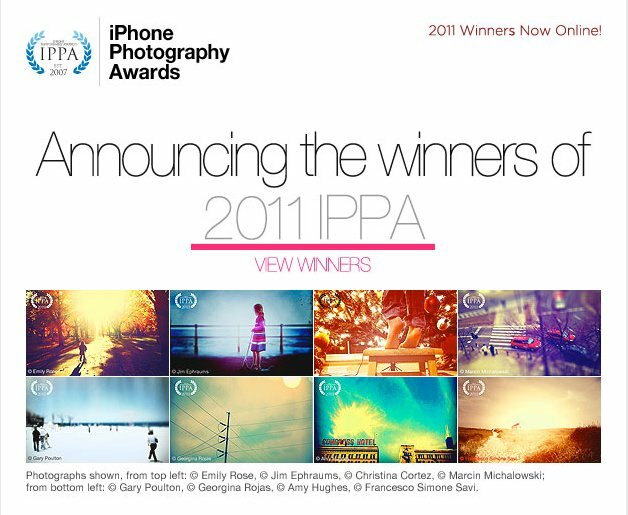 All 1st, 2nd and 3rd place winners from each categories will receive a IPPAWARDS certificate. IPPAWARDS judges will award several Certificates of Honorable Mention to entries to acknowledge talent as they deem fit. Members of the Jury will review all entries and judge images on the basis of artistic merit, originality, subject, and style and ultimately decide the winners. Copyright and all other rights remain that of the photographer. Any photograph used by IPPAWARDS shall carry the photographer’s credit line. Use may include publication in any IPPAWARDS media sponsor publication. All entrants understand that any image submitted to the competition may be used by IPPAWARDS for marketing and promotional purposes including in any media such as exhibitions, print and digital media directly related to the IPPAWARDS competition. All winners will be announced online eight to twelve weeks after the final submission deadline.